We hope the following will help prepare you before you take delivery of your hot tub. Choose an area that will be suitable for you, remembering that you may need to be near a changing area, some privacy may be required, falling leaves may be a concern, and that the light/sunny areas are more suitable. Sheltered areas in the summer may become open during the winter. An area in front of your hot tub should be clear so that grass and debris are not transferred to the water. You know your garden. Firstly, you must ensure you have adequate access for the size of the spa you have chosen. Please note: The dimensions listed in the brochure are the total outer dimensions of the hot tub + or – 5% also allow 5mm for packaging. Check the widths & heights of doorways, passages and gates to make sure the hot tub can pass through. 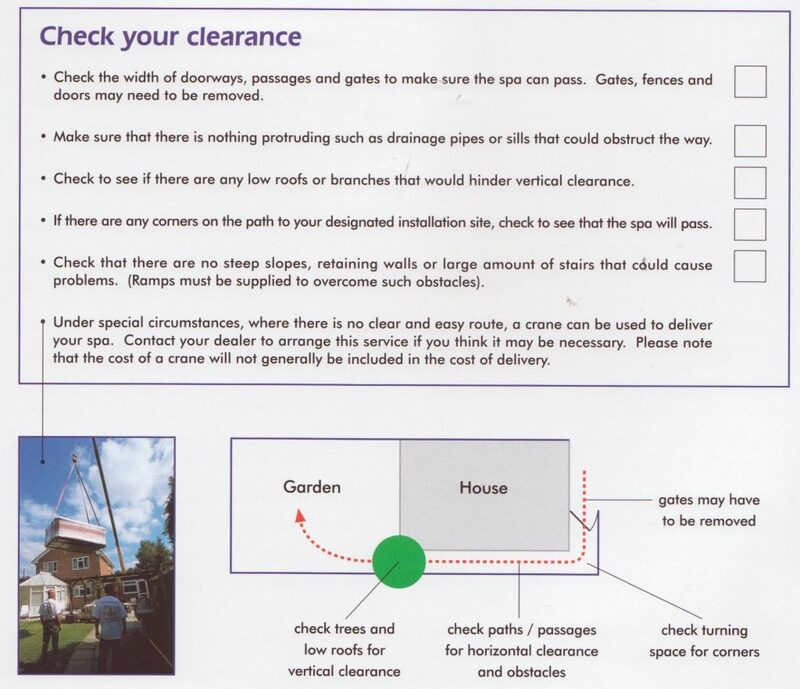 Gates, fences and doors may need to be removed (prior to delivery). Make sure that there is nothing protruding such as drainage pipes or sills that could obstruct the way. The route to where the hot tub is to be sited should be flat and level and not soft ground. Check and inform us if there are any slopes, retaining walls, steps or level differences that may cause problems. Any extra resources required would be charged extra. Under special circumstances, where there is no clear or easy route, a crane can be used to position your hot tub. Please contact us to arrange this service if you think it may be necessary. Please note that the cost of the crane would be charged extra. Most hot tubs are delivered on their sides on a specially made hot tub cart, (see picture). You must therefore make sure the access is big enough for the hot tub and the cart. Please bear in mind the height of the hot tub will increase slightly when on the cart by approximately 6 – 8 inches (150 – 200mm). If access is through/across a neighbouring property/land you must seek permission. Our installers will not proceed without your assurance that permission has been gained by you. Smaller hot tubs (hot tubs under 1.9m x 1.9m x 750mm) may be delivered on a castor board. This enables the hot tub to be moved easily over perfectly level and hard ground (eg. level slabs, etc). Please specify if this is required before delivery. However, the ground leading to the hot tub must be very level and hard (i.e. slabs, concrete or macadam), as the castors will dig into soft ground and loose stones. Wherever you decide to install your hot tub, it is essential that a solid foundation be provided. Grass is not suitable. Please note: It is the responsibility of the customer to provide a suitable base that is flat, level and solid to prevent distortion from occurring. Any structural damage caused by improper base or base failure may invalidate manufacturer’s warranty. An ideal base would be concrete 4 – 6 inches (100 – 150mm) thick. However, existing patio slabs and block paving may be utilized but must be flat, level and on a satisfactory sub base. Wooden decking is also a popular base. However, all bases must be able to take the weight of the hot tub plus the water and occupants. No form levelling by means of “packers” is acceptable. NB. Bases must be prepared in plenty of time prior to delivery, thus allowing time for the concrete, etc to fully cure. Access is required around the hot tub for any future maintenance, ideally 24inches (600mm). If this is not practical then the area should be of sufficient size so that the hot tub can be moved when empty of water for access. The front has to be accessed for routine maintenance. A suitably qualified electrician e.g. NICEIC registered, must carry out all electrical work to the IEE latest standards. The electrical supply will be permanently connected (hardwired) to a single-phase 240V supply from the earth leakage protected consumer unit directly to a waterproof switch. A clearly labelled 3 core (live, neutral & earth) armoured cable connected and isolated with the waterproof switch is required. The cable must be left at the side of the hot tub not underneath. The cable must have at least a 4 metre tail from the edge of the hot tub, for our installers to connect into the hot tub. A Certificate of Approval to Part P of the Building Regulations will need to be produced. Failure to produce or to meet our terms will result in your hot tub not being connected to the electrics and we will be unable to commission the hot tub. The connection must be made at the consumer unit, as the installers will only connect at the hot tub end. Please refer to your order form for the exact electrical requirements for your hot tub. A mains water supply with reasonable water pressure, connected to a garden hose must be provided by the customer to fill the hot tub. This should be flushed through to expel stale water. The hose can also be used to empty the hot tub when changing the water. A standard 240V 3 pin electrical socket is required within 10 metres of the base for lowering the hot tub. A degree in chemistry is not required! A chemical starter pack can be purchased with your hot tub. The installers will explain the treatment required. They will also show you how to conduct the test with remedial actions. A hot tub water treatment manual will also be supplied with the hot tub. The hot tubs all have digital controls and you will be shown how the main controls work by the installers. However an operation manual is supplied with the hot tub for you to be able to set the controls for your ease and comfort. 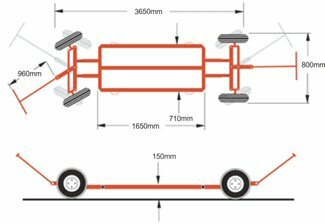 We supply two people to install the hot tub on our hot tub cart. They will NOT be able to remove the hot tub from the hot tub cart until it reaches the base. If access is difficult, extra assistance by able bodied people will be required, which you will have to organize prior to the delivery. If you are in any doubts with your access, we will be happy to arrange a site visit or look at photos emailed to us. We hope this leaflet helps you prepare for your hot tub/portable hot tub. If there are any questions or queries you may have, please ask us prior to delivery. Unfortunately, we cannot advise on how to cope with the anticipation and excitement of owning a hot tub! Please see specification for the individual hot tub models on the website.